Alert readers will notice our evolving format. Looking around at a turbulent world, we decided to direct our attention there, by hosting some writers of national stature reporting about it. In doing so, I’m merely going where my evolving interest is taking me. You are also invited to visit the blogs of two new columnists I plan to feature here, James Howard Kunstler and Bruce Enberg. 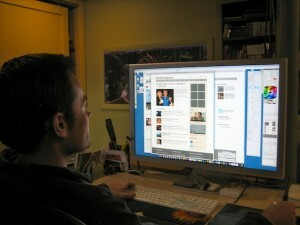 Links to their blogs can be found at the end of their articles. Some of our favorite contributors will be missing from this site, at least for now, while we look for someone to help us post their work. Meanwhile, you can follow their writings at these locations. You may want to add some or all to the sites you visit or to your RSS feeds. Louis S. Barnes’ weekly updates on the economy appeared here weekly. You can subscribe to them by e-mail on his web page. Alexia Parks’ column continues to appear on HuffingtonPost. Dan Culberson’s “Hotshots” movie reviews will continue to run in audio form on KGNU and as audio and videos on Channel1 (RSS feed). One formula — like the online paper in Hawaii where former Rocky Mtn News editor now resides — is find rich guy to fund the venture. Content is king, but good writers need to be paid. I got your email about possible interest in equity. If you are setting up a meeting or want to have a coffee, I would meet. I think it’s a very challenging situation to find a path to revenue and profits with online newspaper site, particularly in a small market like Boulder. Not saying it can’t be done, but as much focus would have to be paid to sales as editorial. And of course to get those sales, going to have to prove some real traction and visitor views to the site. Sort of a Catch 22 situation. You asked for it, and we found a way to consolidate all nine newsy Twitter feeds onto one scrollable page. No more hopping around like a jackrabbit to gobble up a lot of Boulder goings-on. Just go to a single page, namely, this one. As we read the papers this week, we noticed that a peculiar phenomenon has begun to pop up in editorial pages concerning high prices, and we just couldn’t help but smile when Yucatan was mentioned. Editor and writer Bob Wells talks about manufacturers who “have a lot of nerve” charging what they charge these days (for stove knobs), and organic grocery stores whose products are affordable only to the Land Rover driving crowd. Then he begins to sing the praises of living in Mexico, Merida in particular! He gives a link to a local real estate company just in case his readers can’t believe how much better it is in Merida than where they live. By then, we’re chuckling. Here’s the link to Eye-popping U.S. Prices Force Americans Southward by Bob Wells. See it on the original Yucatan Living page, then linger to enjoy this beautiful site. 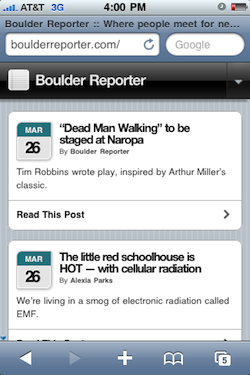 We now have a mobile version of Boulder Reporter. When you go to our site, you’ll find our content specially formatted for mobile devices, thanks to a neat WordPress plugin called WPTouch. At the bottom of any page, there’s also a way to jump back to the standard formatting, if you prefer. Yes, we have returned to our original name. Our temporary name of “Boulder Express” was not playing well with the audience. They found it vague — not something you want when branding a product. Welcome back, Boulder Reporter, old friend. Also, since our last update we have added a “Daily Briefing” item designed to summarize for readers the most important stories from other media on a given day. This, like all of our format items, is under constant surveillance to see how it’s behaving and — more importantly — what kind of traffic it’s attracting. Verdict: unclear. Our lefthand front-page column has been renamed “Front Page” to designate a place for particularly important and/or readable stories. We want readers to develop confidence that material presented here will not disappoint. We also added a new middle column “loop” to display stories that, while important, were either short items or of narrower appeal than those in the lefthand column. New logo. The new logo, BoulderExpress.org, is our deployment of a new name and branding — intended to be more open and inclusive, “A community forum.” We think that the old name, Boulder Reporter, had too many associations to printed newspapers. Tax-deductible support. We’re also putting in place a deal so funders can make tax-free contributions. Various layout enhancements: more columns and photos on front page, subheads on stories, front-page slideshow, etc. — After a severe drought of new content, things are looking up. Part of the drought was due to a trip to Tulum and Akumal, Mexico (story and video – certain to convince you to plan a trip – coming soon). Part of it was due to lack of content from others. I used to be pissed off about that, but now I’m understanding: producing good content is hard work, and since we’re not paying and have a small audience for this “Beta” of the site, can I really blame those reluctant to make a similar commitment? My new conviction is that content providers will come on board if I do my part: keep improving the format, start promoting the site and community with PR, Meetups, etc., and maybe even pay people to the extent feasible. So now, I’m oddly confident. — I’m starting to actually get WordPress and CSS. This means I don’t have to run after elusive (and usually very busy) designers and coders in order to modify the site. Of course, some serious thinking at the prototyping and wireframing stage would have been better than plunging in and tweaking a packaged WordPress Theme, but that’s water under the Boulder Creek bridge. We plunge onward. And, after all, there’s no deadline. — We have just introduced a graphical facelift to our front page and typography, created with the help of Dave Wright of stormlab.com (the designer) and Mike Rinow (programmer). — We’ve added a format feature to the site to support the display of advertising in small, square boxes. Details. We’re also planning to add a funding mechanism whereby underwriters can support specific enhancements we want to add. — Thank you to people who continue to contribute content. Videographers…are you out there? — Through a new alliance, some of our news and opinion content will now be featured on HuffingtonPost/Denver. — Longtime Boulder County marketing guru Thomas Krasomil has joined us as a Reporter, and Boulder journalist and publisher Jerry Lewis, formerly with the Denver Post and Boulder County Business Report, will contribute periodic columns. Lee Buric is advising us on incorporating more video into the site. — We are in discussions with other potential reporters, columnists, videographers and web developers. We also continue researching business models. — Your advice and offers to participate are welcome. Leave a comment below or call or e-mail me privately. In particular, we still need a strong web developer partner to improve design and add more features, especially “social media” enhancements. Our low-profile project has been discovered – and exposed! – by the mass media. See this totally accurate account in a column by Publisher Chris Wood in the latest Boulder County Business Report. Hmm…time to pick up the tempo of this otherwise rather languidly pursued project? I am agonizing over whether we should be a for-profit or nonprofit entity. That’s kind of encouraging, don’t you think? I think advertisers and content contributors might be more inclined to be involved with a nonprofit entity. Pretty strong case. Additionally, I like the idea that we could zealously pursue a good ol’ capitalist business model and not only gain enough revenues to pay the bills (and salaries?) but maybe even have a chance of creating a property that has some value – which is, after all, how actual money tends to be made in the aforementioned capitalist system. Your comments on this issue are welcome. An opportunity may be emerging for someone to create a platform for pithy, valuable reporting and insightful commentary about life in Boulder, Colorado. It would be directed at thoughtful, educated, mature adults who are involved in, and care about, the community. Its point of view would be Boulder-ish, which is “progressive” but certainly not doctrinaire leftist. In tune with the approach of our new president, the emphasis would be on problem solving and doing some good. Our analysis is that certain preconditions probably need to be met before this project can proceed. Precondition One would probably be the demise or further shrinkage of the Daily Camera. How likely is that? The Camera’s parent company, MediaNews Group, is not healthy financially, so the future of their properties (including the Camera, the Colorado Daily, and the Denver Post) is uncertain (see Postscript below). Insiders suggest that with MediaNews’s heavy debt load, and with all the publications probably losing money, business as usual can’t go on forever. The two other local newspapers, Boulder Weekly and Boulder County Business Report, serve niche markets (under-30s and the business community, respectively). Precondition Two (perhaps an easy technicality) would be our ability to follow the example of other community websites in becoming a nonprofit (501c3) corporation so we can accept tax-deductible support from individuals and foundations. Others such as The Voice of San Diego operate this way, much the way public radio and TV stations do. We have quite a few ideas already about possible funding sources. Precondition Three would be my ability to assemble a strong core of reporters, videographers, bloggers and editors to make the content happen. A key ingredient will come from Web developers and designers who can help us offer the latest in friendly, helpful technology (WordPress plug-ins and gorgeous, dynamic design elements come to mind). Our intent is that content contributors will be paid, because creative work and reporting are inherently time-consuming. Those who don’t need the money and those able to dash off amazing opinion pieces breezily and fast will be asked to work for the good of the team. Investigative reporters in particular would presumably earn semi-decent money. I’ll have more to report on my progress in researching the viability of this project, and enlisting allies, as we go along. If you think you have something to contribute, contact me at [email protected]. And let’s get together soon to brainstorm — the pizza and beer at Laudisio will be on me! Two newspapers are reporting that Denver-based MediaNews Group has reached an agreement with its lenders and bondholders to delay a principal payment on its debt. The Wall Street Journal and The New York Times, citing unidentified people, reported the company reached an agreement to pay only the interest on a payment due March 31 while it renegotiates with lenders. That’s just what we had in mind.